Unhook your mind from the outer world. Bring your entire personality, for what it is worth, to melt into the rhythm of the classical dancer’s movements. Allow her to lift you in an adventurous flight, into realms unknown, where you can live directly the bliss Supreme. 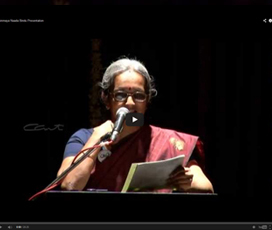 Swami Chinmayananda’s love for the arts, and his vision of a cultural renaissance, inspired Swami Tejomayananda to envisage Chinmaya Naada Bindu (CNB), a residential Gurukul for Indian Performing Arts which was inaugurated on September 13, 2009. Situated in Kolwan, near Pune, with a mighty backdrop of the Sahyadri mountain ranges, Chinmaya Naada Bindu offers a welcome setting for students, practitioners, artists and scholars from all over the world. The main art forms presently taught are Hindustani Vocal, Hindustani Flute, Bharatanatyam and Tabla. Vision : To develop the art of music and dance as a means of inner purification and self-realisation and to create artists and art-lovers who will be ambassadors of universal love, peace and harmony. Fostering artistic excellence • Nurturing the spiritual • Creating global connections Motto : Swara to Ishwara, ‘Nartan to Paramatman’ and ‘Geetam-Vadyam-Nrtyam to Satyam-Shivam-Sundaram’. 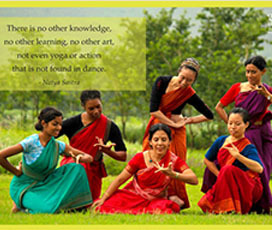 CNB is dedicated to nurture and spread Indian performing arts and also propagate India’s Vedic heritage in the process. Arts are promoted as a vehicle with which to journey within, in search of the divinity that lies at the core of one’s being. The Gurukul atmosphere gives students the spiritual environment for this learning.